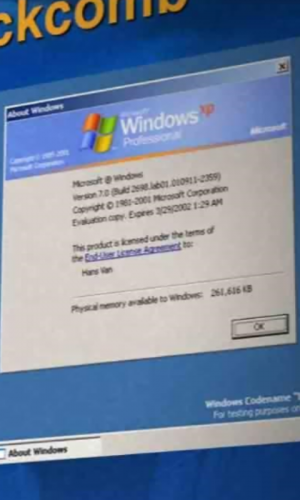 There's one screenshot of Windows Blackcomb build 2698.lab01.010911-2359 (zoom to see) likely taken by Microsoft due to having the same font as their Longhorn videos, does this build ever exist? Pretty sure this is fake. It uses Vista-era shutdown and lock icons. 2) Why would an official presentation have a screenshot of winver out of all things. What is the source of this image? Reverse image search yielded exactly 0 relevant results. 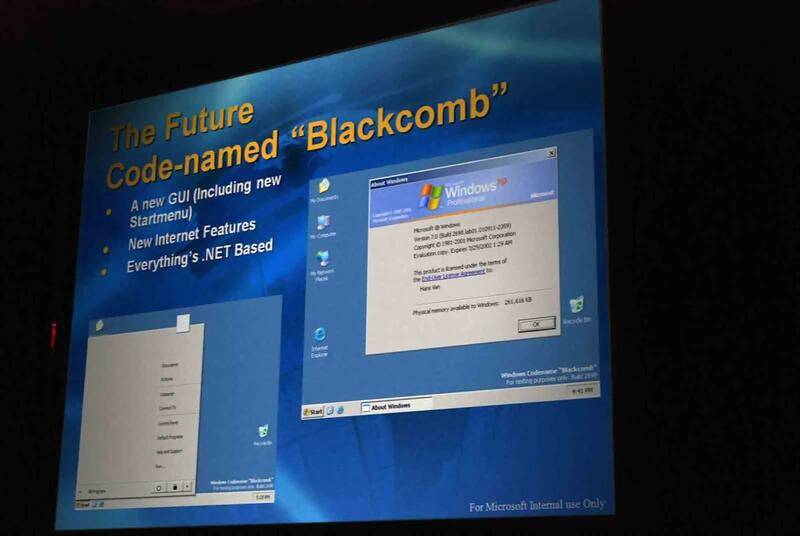 Why would a 2001 Blackcomb build have a Start menu design that wouldn't appear in Vista until 2005? I am also not quite sure how would a new Start menu end up out of all labs in Lab01, the kernel lab, not even a month after 2600. Considering the problems they had during Longhorn development with syncing code among labs, this seems quite weird. Not to mention Lab01 was working on Server 2003 at the time. KenOath originally posted this screenshot back at July 2009 here and it was confirmed fake. Hmmmm... Reminds me of the Longhorn 4057 private build, which turned out to be fake in the end (thanks for ReflectiaX for clearing it up), which was made by Utaks IIRC. Since it has the same weird angle, and being displayed on an LCD screen, I think this is also the same case, as tbh only a small image is visible. And to make it clear, MS never used confidential screenshots, only mockups and sometimes real "known" builds in their presentation. Also, it looks like a newb-ish presentation, "For Microsoft Internal use Only"? Just looks like XP with a vista-style startmenu and icons. The jpeg artifacts are not correct for a picture that would've been taken during the time period. In addition there is a lack of low-light noise (a substantial amount of noise should be present in the black areas. there isn't, only jpeg artifacts are present and not much of those either. this indicates a more modern noise suppression technique) and a lack of noise in general, which should be nasty for a digital camera from early 2000 taking picture of fairly dark projected image and that noise would be further exaggerated by the jpeg compression. These phenomena is not there at all. Meaning the artifacts are too perfect and clean to have originated from a time-period camera, the degradation was purposeully introduced via poor post-processing to a modern camera image. Even my massive d2x pro camera from 2006 would still struggle to capture an image in this scene and a consumer point and shoot 5 years earlier (the most likely instrument to have been used here) would've fared much much worse. Compare this image to many other presentation shots, eg longhorn ones which are considerably noisier yet posess comparable amounts of compression artifacts. So as many others have clearly stated, fake. EDIT: Cleaned the grammer in my original poor google translate post. Last edited by yourepicfailure on Sat Mar 23, 2019 9:29 pm, edited 1 time in total. Not to mention the build number. It's only 98 builds away from Windows XP RTM. The earliest post- XP build is 3683, the earliest Longhorn build known or at least, the earliest build available in the FTP server. Microsoft is known for to jump quite a bit when starting out a new Windows project. Plus the theme Is from Windows XP and The start menu Is From Vista so It's surprises me that Microsoft If so they made those images plus the user picture frame is blank wouldn't it have a picture on it? also the winver says Windows XP Professional. so in my opinion, it's fake. Last edited by OSTOURS on Sun Mar 24, 2019 8:09 pm, edited 1 time in total. 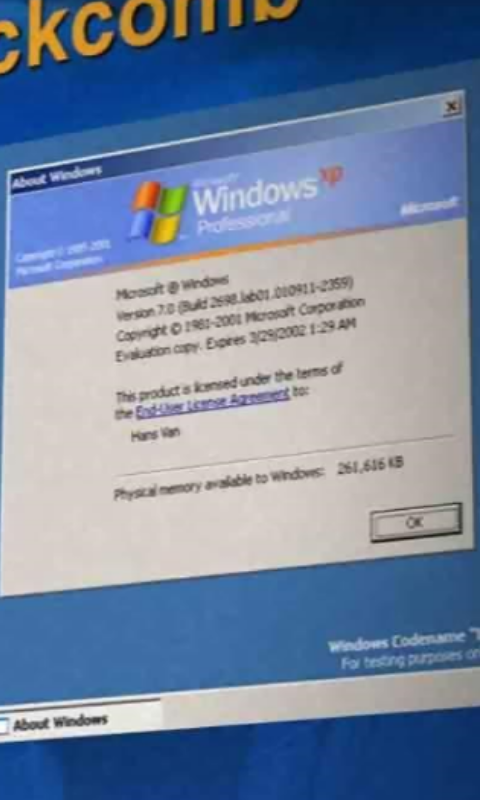 Technically the earliest leaked post-XP build is 3505, since Windows Server 2003 was a Windows version on its own. That image is so badly photoshopped it should be used in a “social experiment” video by Jake Paul! Also, why would Microsoft jump two kernel versions from NT 5.0 to 7.0? It was one thing that they jumped from 6.4 to 10.0 in Windows 10 to match the Windows NT version number to the released number. Like how Windows 7 is actually NT 6.1, 8 is NT 6.2 and 8.1 is NT 6.3. -Open PowerPoint, make a slideshow and place text with these screenshots. Also, two spaces between Including and new. Not to mention that the build tag isn't right at all. Even during whistler, the desktop build tag would display the entire build string. Fake as fake can get. Blackcomb was a name they had on paper. I highly doubt any builds were ever done with that codename - not even Vienna was used, aside from on paper. Microsoft made a point to use codenames for future projects - many of which never became actual builds or products. The theme is Classic not Luna. Doesn't change the fact it is fake. Edit: How did you know the full build string? Hummm... From the photo I can only see 2xxx and the last 3 digits were too blurry to see. Not suspicious at all. Use a glasses. Click on the picture in topic and zoom to see. I can see very closely in a phone. If you still can't see full build string, see I zoomed. yeah if you see here viewtopic.php?t=12509, this same image was public even before kenoath's post in 2009. AKA the origin. In German though. So the unprofessional text is starting to add up (poor understanding of English). Some guy "Hans Van" is the culprit. "I recently got this image of Blackcomb build 2698 from a certain 'Hans Van.' He is a Microsoft betatester and it seems he has ties with Microsoft Internal. This picture came from an internal Microsoft demonstration for programmers. I've attached the image." Coming from an internal MS demonstration for programmers my ###. This date is also before any known Longhorn build. I know the person who did this, though they asked me nicely not to reveal the name, so I am not going to do this. But yes, this screenshot is fake. It's fake. The Start menu is aligned improperly. As well as prove kenoath was not behind it. I'm pretty sure that everyone is convinced by now that this build is definitely fake. Is there really other reasons why, I'm not sure as I don't see them. Build 3505 is a Server 2003 build not XP.